As I mentioned in my return post, I decided in June to use my two weeks of summer break to once and for all attempt to potty train The Incredible Hulk. I promise that I will give you a post about our methodology (UPDATE, you can find that here), but the only thing you really need to know is who your kid is and what works for them. Sure, I read up on some blogs and books and consulted my friendly BCBAs at work, but in truth, I just know TIH. In fact, some days, that's all I know. 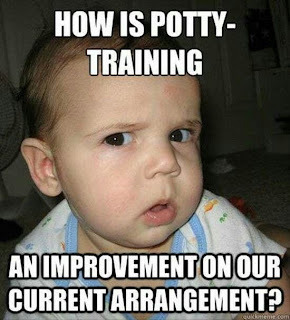 The other thing you need to consider before you embark upon this potty training adventure is the wide range of emotions you will experience along the way. And, given my background in therapy, I was able to see a pattern of sorts. This post will feature some frank discussion of poop, so if you're not into that sort of thing, you probably have never potty trained someone before. Good for you. No. Really. Good. For. You. For me, this stage started a year ago when some of my friends successfully potty trained their children who were similar in age to TIH. I tried to blame it on gender differences, TIH's lack of vocabulary, our tumultuous year, and pretty much anything I could think of to get me out of the idea that I would have to one day teach another person to defecate in a specific location. His school gave him opportunities (most of which were successful) to try the potty. But, at home, he was pretty darn happy in his diaper and I was pretty darn happy for him to be in his diaper. (This coming from someone who once sobbed when she realized how many diapers she changed in a single day.) Denial continued when we started trying him out in his underpants and he would wet them almost every time. "Oh, maybe we should try after he turns 3." "Our wood floors will never be the same." Eventually, I realized I just had to jump right into it. I had two weeks off of school and I kept him home with me for most of those two weeks. Using the methodology I developed mostly from some educated guesswork, I got him to finally stop saying "I want to wear my diapers FOREVER!" 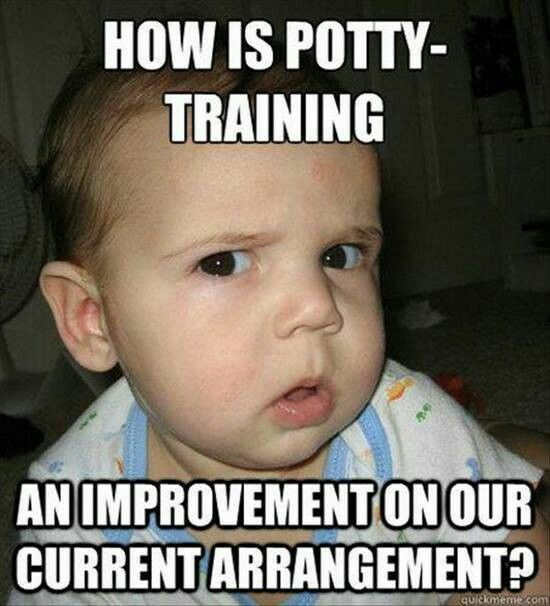 and we were officially potty training. We had three successful trips to the potty and I was on top of the world. After some successful trips to the potty and a nap (wearing a Pull-Up, I'm not insane), TIH woke up, happy to put back on his big boy underpants. And then, while we were playing, I saw him get a familiar look. I said, "Do you have to go to the bathroom?" and he said "I NEED MY DIAPER." What followed involved throwing little boy underpants in the trash can and an accent rug that I'll never be able to look at the same way. I can't say I was angry at TIH. He was new at this and we sort of sprung it on him.. But, I was really angry at myself. Angry for not starting sooner. Angry for starting so soon. Angry for not having a degree in behavioral analysis. Anger at poop in general. The same person that at one time hated changing diapers, REALLY hated cleaning up accidents. There were tears. Both from me and TIH. He yelled at me a lot. He really did not want to do this. And he begged me...A LOT for his diaper. I channeled my anger in healthy ways (like eating large handfuls of potty training M&Ms), but it was still very difficult to come home knowing that I would likely have to clean up another mess. I also knew that we could not go backward by giving in and putting him in a diaper. And that, made me more angry than anything else. After one successful trip at "dropping the kids off at the pool" I started to feel a lot more confident about our abilities to conquer the potty training beast. TIH did NOT feel the same. He was still very much in the anger phase of "putting his poop in the potty," and avoided it at all costs. This did include me physically lifting him onto the toilet SEVERAL times when I KNEW he was trying to go in his pants. (For those of you well-versed in bathroom independence, I KNOW, I KNOW, but I could NOT clean another mess up off of my floors. I couldn't.) And with all of this assistance, it still rarely yielded results. This is when I began to bargain with him. I say bargain, but what I really mean is shamelessly BRIBING him to go on the potty. Forget the behavior system I had so carefully worked out. (I promise, I will share that with interested parties in the near future.) Forget the fact that I do not have a million dollars. I would have given it to him if he would just crap in the toilet. That isolated feeling made me feel quite depressed. TIH was bored of our four walls and lost interest in the toys/stickers he was earning almost as soon as he earned them. At this point, it was difficult even to celebrate the successful trips to the potty because I always dreaded if the next one would end up being another accident to clean up. TIH, finally accepting that the diapers were gone for good, told his daddy that he needed to use the potty and went poop all by himself. They say that the day you have your kids is the best day of your life. They're wrong. For me, it was when we took a celebratory trip into the city and my kid asked me to go potty and was able to go by himself in the small closet that barely resembles a bathroom on the train. (Dude, I'm almost 30 and that is still hard for me to navigate.) In fact, he was able to remain dry for our entire trip to the city - utilizing a variety of bathrooms (the train station, a restaurant, a tree in Millennium Park...). So, that's our story. Methodology to come, but don't get caught up in all of that. I say, with sage wisdom, it will happen eventually. I can't promise that your journey through this madness will go the same way or have such a happy ending, but I can tell you that however you do get there - you're going to need a lot of Clorox wipes. I laughed a lot at this one but man does it sound like a challenge :) Congrats on making it through! Haha I say congratulations. My thoughts are "well they will be potty trained before kindergarten, so no big deal" and we will all make it through alive, eventually. My son's preschool teacher told me not to worry that someday it would be his wife's problem! It was good she had a sense of humor -- uh, his teacher; not his wife!